This study’s primary focus is to bring to the fore of discourse the importance of workers’ sources of power that the domestic workers’ unions in Namibia can explore to organise and mobilise enough support for the actualisation of the minimum wage and decent working conditions for domestic workers. In partic-ular, how they can sustain the gains of their agitation for domestic workers in Namibia. In achieving the objectives of this study, a qualitative methodological approach was adopted to collect data through semi-structured interviews, focus groups discussion and working with the text. 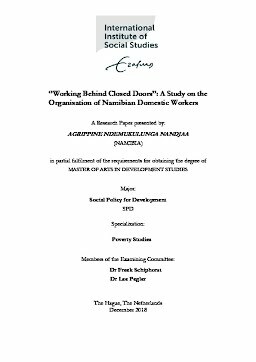 With the help of the conceptual framework that comprises of agency, empowerment, power, and solidarity as data analysing tools, this study was able to identify the challenges that can hinder the domestic workers unions in Namibia to tap into the workers’ sources of power to improve their capacity to organise and mobilise. The study found that out of the four sources of power, only institutional power has a fairly strong presence in Namibian domestic workers movement. The associational power is very weak and would have benefited from the societal power through coalition forming if only the domestic workers unions would not have been into unpro-ductive rivalry. However, the biggest obstacle to harnessing worker sources of power in Namibia is the lack of structural power which is further reinforced by poverty, lack of trust in the union leadership as well as lack of funding for the unions to operate. The study discovered that there is hope in strengthening do-mestic workers union positions in the country if the members of the unions are empowered to have access to alternative income that will allay their fear of losing their jobs to their employers who have unrestricted access to alternative sources of labour. Besides, the two unions must come together to present a unified front to be taken serious by other unions and stakeholder, form alliance with non-union social force to address burning fundamental societal issues in a bid to establish coalition and solidarity. Most importantly the Ministry of Labour should establish branch offices in various informal settlements to give access to DWs that might want to report their employers as well as NUNW should play a role in the issue of funding and international support for the DW movement.